Foodborne disease and other food safety issues are among the greatest development challenges we face globally. This fact has been established from many angles: World Health Organization (WHO) research, for example, places the global health burden of foodborne disease on par with HIV/AIDS, TB, or malaria. Meanwhile, in 2016, the World Bank estimated its financial burden from lost human capital, treating disease and trade loss in the tens of billions of US dollars. More concerning, this burden is not equally distributed across the world: 98 percent of health impacts, according to WHO, are shouldered by developing countries, and Africa carries the largest load. The task of addressing the health impacts of foodborne diseases and food safety in Africa is complex and deeply connected to larger nutrition challenges. Children, the elderly, pregnant women, and those who are immunodeficient are most at risk from the effects of foodborne disease and are also among the groups most nutritionally at risk. Consuming a more diverse diet is a key way to combat the multiple burdens of malnutrition, including stunting and undernutrition, but the most nutrient-rich foods, like dairy, meat, and vegetables, are also among the riskiest from a food safety perspective. Solving the health problems of foodborne disease in Africa is only part of the food safety battle: we must also grapple with the wide range of economic costs, which range from lost productivity due to illness, to cost of response and prevention, to trade. The World Bank estimates that in 2016, Nigeria, South Africa, and Angola each had foodborne disease costs exceeding $US1 billion. Impacts of these costs have further effects as countries are excluded from markets for high-risk foods, and future trade opportunities are lost. And while the international markets hold great promise for African financial development, domestic problems cannot be ignored. At the national level, lack of consumer confidence in the safety of food erodes both the productivity of the domestic market and trust in the government and food safety authorities. 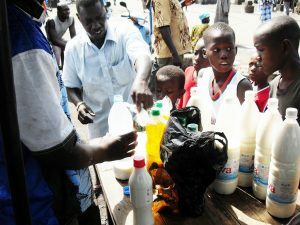 The harnessing of today's market drivers of progress on food safety in Africa. The food safety challenges we face in the African continent and globally are daunting, to be sure, but if partners at all levels are willing to work towards this common goal, together, we can save lives and build stronger futures in Africa and beyond. Silvia Alonso is a Senior Scientist - Epidemiologist at the International Livestock Research Institute, conducting research with A4NH's Food Safety flagship. This post is based on her presentation at the African Union Special Event on Trade of Safe Food in Free Trade Areas, at the First FAO/WHO/AU International Food Safety conference, held in Addis Ababa, February 12 and 13, 2019. For further information, please see the conference paper submitted by Dr. Alonso and colleagues.